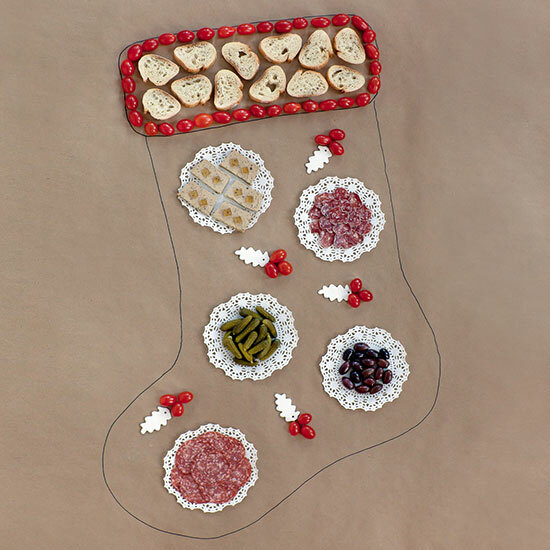 Three Little Halves blogger and illustrator Aleksandra Mojsilovic reimagined the holiday table for those who are tired of bringing out the china, trying to avoid impulse-buying festive tableware or simply looking for an ingenious way to reduce cleanup. All you need is a black marker and some Kraft paper. You will need your favorite salami or two, chicken liver pâté, cornichons, kalamata olives, cherry tomatoes and baguettes. Cut the Kraft paper to the size of your table, place your goodies on small cake doilies (with some wax paper under the doilies), arrange them on the paper and draw a gigantic Christmas stocking around the whole thing. Now that you mastered the technique, why not wrap some presents too? Inside can be the hummus deviled eggs, lemony pea mash sandwiches and the tiny bites of ajvar, the famous Serbian red pepper spread. 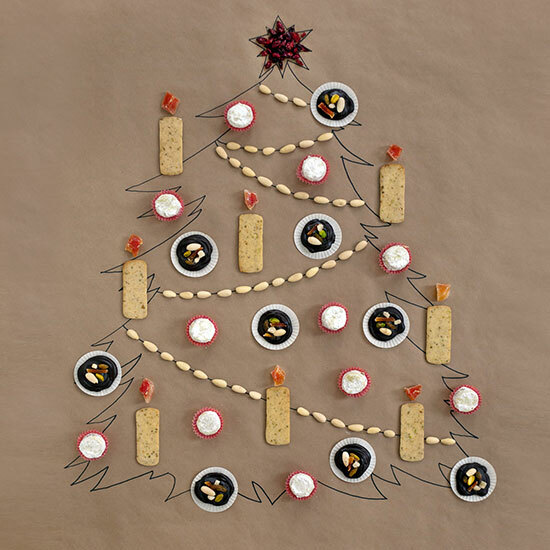 There is no Christmas tree like the one decorated with cookies. Cut the Kraft paper to the size of your table. 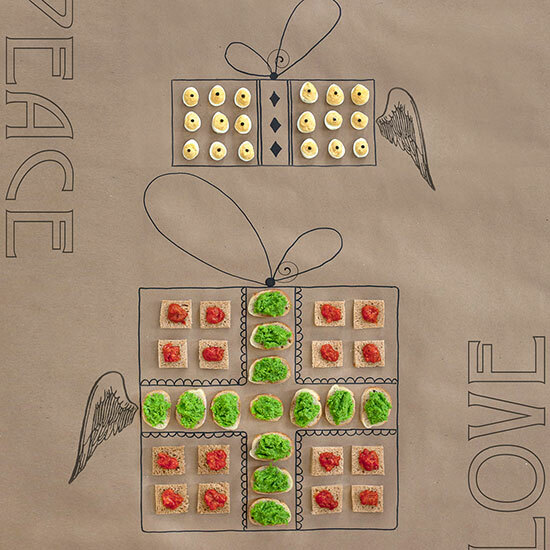 Draw your best Christmas tree, even a triangle will do, and decorate it with the cookies and dried fruits. Chocolate mendiants make for spectacular "jeweled" balls, accompanied with snowflakes of pistachio orange blossom winter cookies. Light up your Christmas tree with Citrus-Scented Crisps as candles, topped with chunks of dried papaya flames and wrap it up in almond garlands. And, most importantly, do not forget to crown your tree with a star of glowing cranberries! 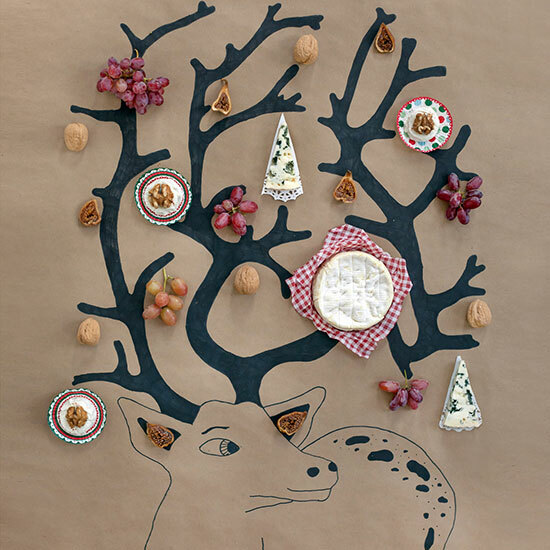 Christmas doodle experts can attempt to execute more advanced subjects, such as the reindeer decorated with a Camembert crystal ball, Roquefort bells, goat cheese medallions, grapes, figs and walnuts. 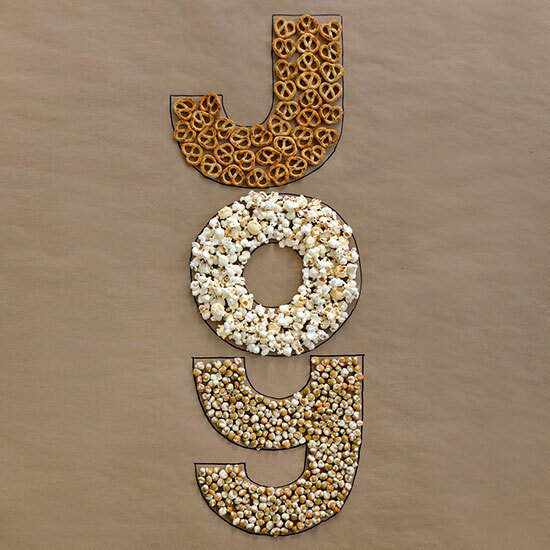 If making fancy art is too much to pull off, you can still write: Happy, Merry, Noel, Wish, Joy—any style, any phrase, any language will do as long as you have pretzels, popcorn and wasabi peas to fill in the blanks.